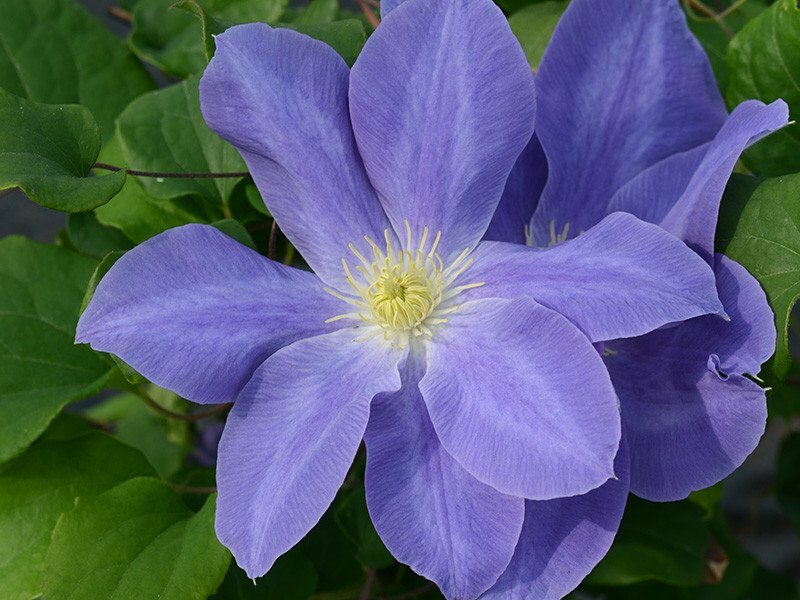 Clematis Diana’s Delight has a special and unusual blue colouring. Its 7 to 8 sepaled flowers have a creamy yellow centre, which contrasts very well with the mid blue colouring of the sepals. Each sepal has light and dark tones, especially towards the centre of the sepal. The flower shape is full and rounded with each sepal fully overlapping its neighbour, each with a pointed tip. The leaflets are rounded in shape and quite distinct. However, it is the very free flowering habit of the plant that makes it quite distinct. It produces an abundance of flowers at one time in late spring, early summer and is repeat blooming in late summer. This plant, of compact free flowering habit, can be grown most successfully in a container for the patio or be grown through other wall trained evergreen or deciduous shrubs and other climbers. It looks marvellous with deep blue Ceanothus or with silver or golden foliage shrubs such as Euonymus. Note: Clematis Diana’s Delight™ Evipo026 (N), which will be launched at the 2009 Chelsea Flower Show, is named “Diana’s Delight” after Lady Diana Rowland. Diana has been involved in the preparation of Raymond Evison’s last four clematis books. She is the wife of Sir Geoffrey Rowland, the Bailiff of Guernsey. Bailiff is an ancient office, dating back to the 13th century. The holder is the senior judge in the Bailiwick of Guernsey, presides over Guernsey’s parliament, the States of Deliberation, and is the island’s first citizen. Lady Diana Rowland is a trained botanist and was responsible for establishing a collection of historical clematis in the island’s Candie Gardens.